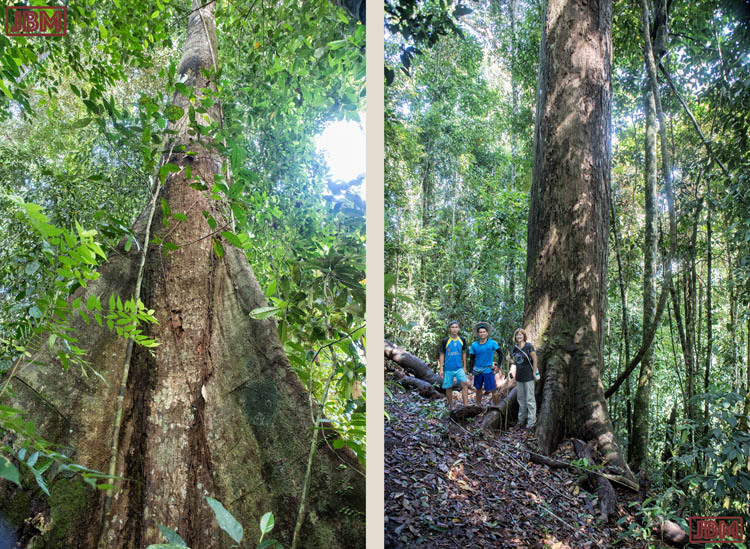 Two of the large and rather imposing trees in the Tane’ Olen forest upriver of Setulang, North Kalimantan, Indonesia. One (and possibly both) of them is a Yellow Meranti (Shorea faguetiana). They grow TALL – the biggest recorded one is 93m, found in nearby Sabah province of Malaysia). Some people like to refer to the Tane’ Olen as the ‘Forbidden Forest’ – the name coming from a decision by the local Dayak Kenyah community of Setulang to prohibit extractive activities such as logging. If it’s not ‘forbidden’, these trees were certainly difficult to get to: from Balikpapan it required two flights, one hour of driving, one hour in a ‘perahu’ canoe, and one hour on foot ascending a track up a steamy slippery ridge. Worth every bit. This entry was posted in Indonesia and tagged Kalimantan Utara, North Kalimantan, Setulang, Shorea faguetiana, Tane' Olen, Yellow Meranti. Bookmark the permalink.